Don’t worry, I haven’t lured you in to this blog post under false pretenses. 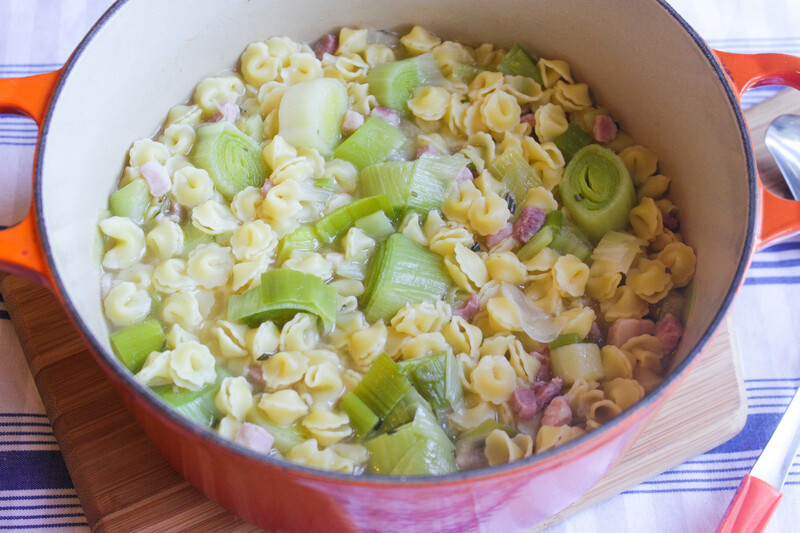 This recipe for Leek & Bacon Pasta Soup is, arguably, the easiest soup ever. It takes very little preparation and about 15 minutes to cook. Even though it’s simple, it’s very comforting and perfect for cold evenings after a busy day. Or you can whip it up as a quick yet satisfying lunch, like I did earlier today. An important part of this recipe is the chicken stock, so use the best quality that you can find, or even better, use your own home-made stock! I feel that shop-bought chicken stock is often too salty so I haven’t used very much in my recipe. Feel free to tweak that and add a bit more. I found my little Emiliane pasta shells in Little Italy but if you can’t find anything similar, any small pasta shells will do! I’ve made this quite a few times now. Each time, I’ve halved and slightly adapted the original recipe, but not very much! Start by heating a drizzle of olive oil in a large deep pot over a medium to high heat. Meanwhile, chop the white part of the leeks into rounds, keeping the green parts for another day (a nice risotto, maybe?). Wash these leek rounds really well. When the oil is hot in the pot, fry the leeks and bacon for 5 minutes, stirring well. Meanwhile, pick the leaves from the rosemary sprig and finely chop them. 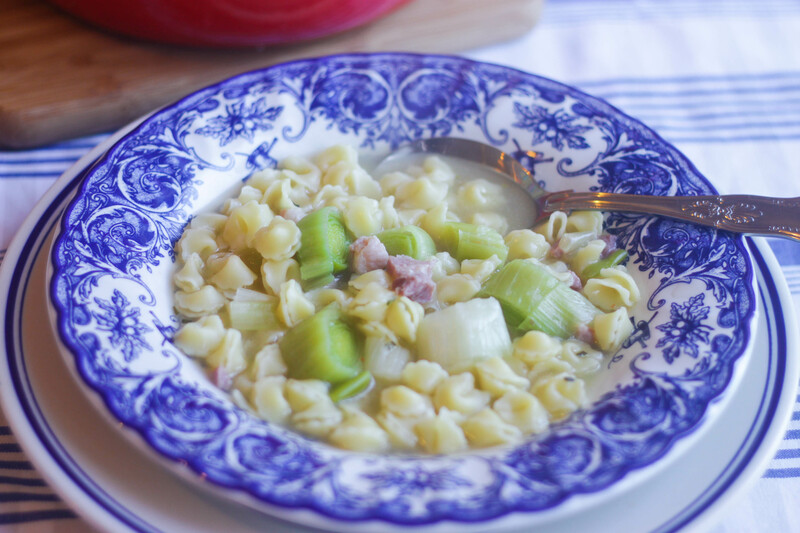 After the leek and bacon have add 5 minutes, add the chopped rosemary, the chicken stock and the hot water to the pot. Simmer for 5 minutes. Then add the pasta shapes and simmer for another 10 minutes, until the shapes have cooked. Serve with a bit of bread if you like, but it’s already comfortingly carb-y what with the pasta and all. Listening to Blackbird Blackbird’s latest tune Tear while cooking helped make it an even more calming experience. I love those kind of meal-in-a-bowl soups, especially in this weather. Me too! It’s nice to be able to make something quick that’s still satisfying.Thanks for your comment, Caroline! Perfect. I tried a potato, leek and bacon soup of my own design last week, but this seems like a much better bet. Of course I probably didn’t have the right soundtrack either I love being able to bring something like this into work for lunch. Thanks Aoife. Thanks, Mark! Your soup sounds gorgeous. Mine is just a cop-out lazy version of a potato and leek soup. 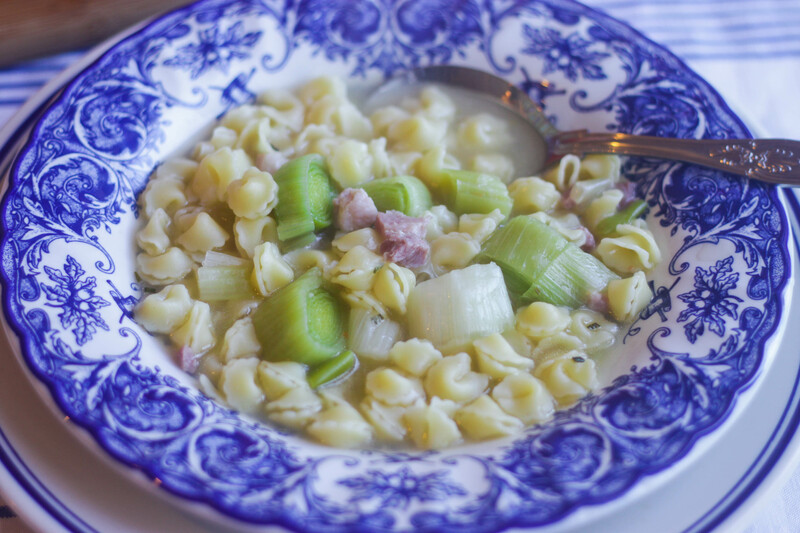 You get the carbs of a spud-based soup with none of the peeling or chopping of the spuds. Like I said, super lazy! Definitely a good one for a packed lunch, keeps very well til the next day.